A few times I’ve traveled abroad for a few weeks with my older brother as a companion. As siblings, we’re comfortable saving money by doubling up in one room, but as light sleepers and both occasional snorers, we were both forced to learn creative ways to sleep in strange places. Here’s my list of 5 Products I pack on every trip that almost guarantee I can sleep through anything. These are not paid placements, but are actually products I recommend. (Some of the links are, however, affiliate links that help keep my blog online. Clockwise from top, my favorite sleep aids are: 1. SleepPhones 2. Benadryl & Melatonin 3. A (really good) Eye Mask 4. Noise-Cancelling Headphones 5. WhiteNoise App (Not Pictured). Wireless SleepPhones (Pictured, my older wired version) – Slap on the back to the inventor who created a fleece headband style set of earphones with speakers that are *actually* flat. Similar products seem to be just regular earbuds inside a fleece band, but these are the real deal. These soft fleece headphones are the best way to block light ambient noise and play sleep inducing sound without disturbing your partner or roommate. The flat speaker design inside the fleece band means none of the issues of trying to sleep or fall asleep wearing headphones. Benadryl & Melatonin – You won’t create a chemical dependency in one vacation, and the health benefits of sleep far outweigh any health risks (for most people) of these over the counter medications. Be sure and pick up Benadryl (Diphenhydramine) at a wholesale club or from Amazon because corner markets and sometimes even larger chain drugstores charge up to 20X as much for Benadryl. For Melatonin, I’m partial to the Source Naturals brand, because they offer smaller doses and dissolve-under-the-tongue tablets, which act faster than my brain can reach the frustrated-and-I-can’t-sleep point of trying to go to sleep in a strange bed. Contoured Eye Mask – A good sleep mask is essential. Avoid sleep masks from big box stores and purchase a sleep mask designed by a company that makes sleeping well their business. Good materials and good design really matter on something you will wear on your face for 7-10 hours each day of your trip! Shown is my Alaska Bear Silk Sleep Mask, which I like a lot, but I prefer this contoured eye mask because it takes the material’s pressure off of my eyelids. Fair warning: I washed my contoured eye mask in a machine washer once and it began to deteriorate! Hand wash only. Audio-Technica QuietPoint Active Noise-Cancelling Headphones – The best. Seriously. The best. I don’t travel by bus, plane, or train without these headphones and they are largely responsible for most of my papers written in coffee shops and libraries during grad school. Paired with the WhiteNoise app (below) these can drown out 80% of ambient sound at any volume. I don’t sleep with these unless I have to (i.e. bunking with a loud snorer) but 90% of the time these can do the job alone. 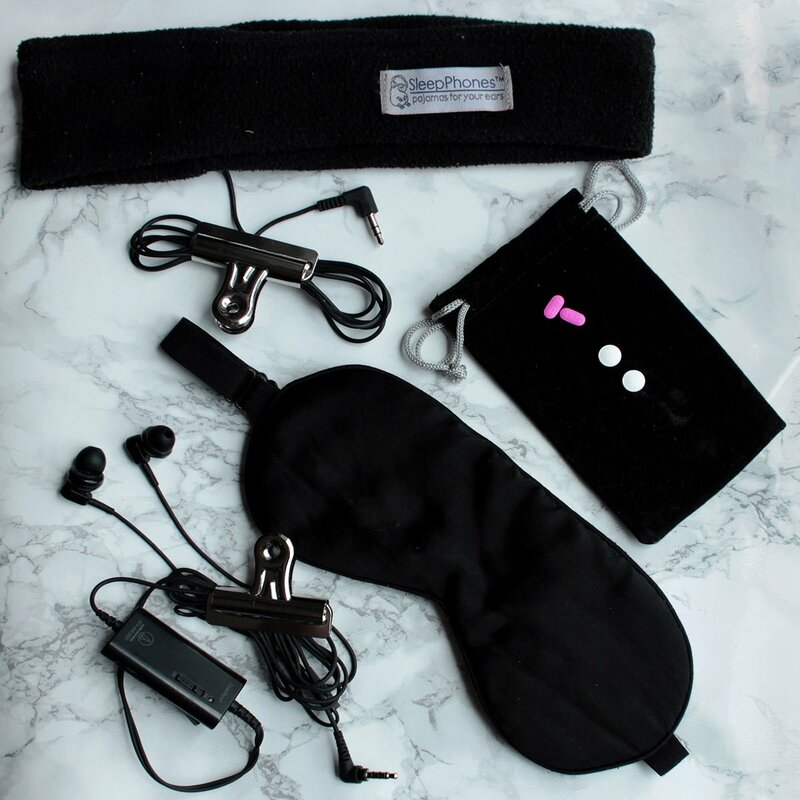 If you want to find yourself in sheer ambient white noise silence- pair these with SleepPhones and silence even the loudest snorer. By allowing me to sleep, these might have saved my roommate’s life in Germany once. WhiteNoise App – Because for $1.99, 1,800 amazon reviews can’t be wrong. Anytime I need to concentrate in a space with background noise, this is my go-to app. This app paired with QuietPoint Headphones can make you absolutely forget you in the back row of an airplane, a crowded coffee shop, or in a room with a partner not quite ready to turn off the Late Show and go to bed. 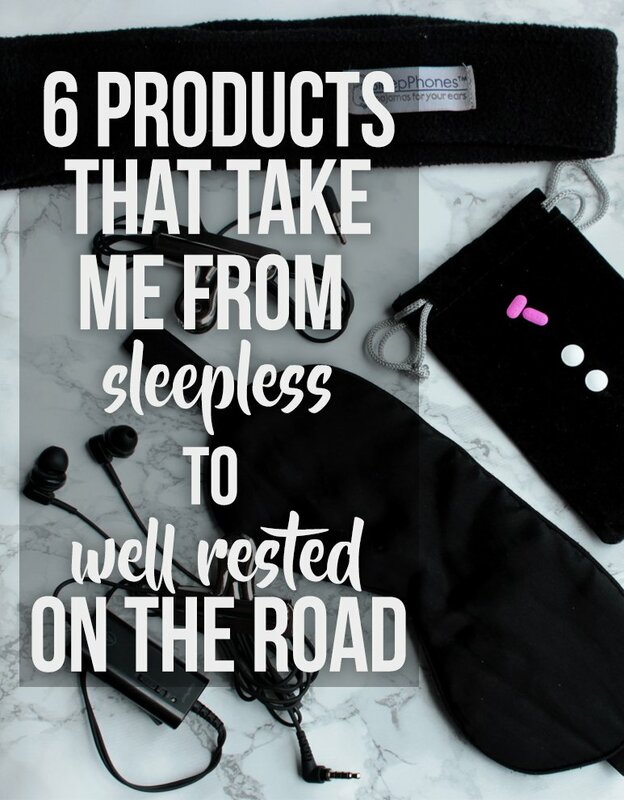 These 5 (ok, 6ish) products have saved my sleep and my sanity during many travel adventures. Getting great sleep is so important to fully enjoying your vacation and experiencing what your days hold. Now that I live in Seattle with 4:30 am summer sunrises and downtown nightlife noise lasting long past midnight, these are products I use every day and am glad to share. Chamomile, melatonin. I’ve gulped red wine in a frenzy “dying to sleep”. It helps, though addictive. It’s better than psych meds.